Regardless of the subjective side of espresso tasting, there are a few objective things to consider when evaluating some espresso beans. The factors are coffee freshness, the origin of the beans, the quality of the beans, and the packaging and storing. Klatch coffee is famous in the industry. The Perry family has done a tremendous work in the coffee business, on all levels. Mike Perry prides himself with numerous successful blends and single origins. The company claims they only buy quality beans from the top 1%. Their WBE blend, (World's Best Espresso), is indeed close to perfection. The blend was named the best espresso in the world at the World Barista Championships, so it's not just an empty title. This blend has a sweet and bright fusion of chocolate and orange notes. The lingering caramel finish will make you want a second shot and a third one! You will have to stop though. The famous blend made with three fantastic beans, Brazil Yellow Bourbon, Ethiopian Natural, and Sumatra Lake Tawar. The beans are roasted separately and blended at the end for maximizing characteristics in each bean. This is one of my absolute favorites, and the coffee is always fresh when it ships to customers. The biggest advantage is that they sell and ship, so they can ensure the beans' freshness. Sure, there are many advantages to use Amazon's shipping services as a seller, but coffee beans should always ship near the roasting day. Klatch coffee has another fantastic blend, the Belle Espresso. In the video below, Heather Perry from Klatch Coffee, U.S. Barista Champion and more, talks about making the perfect espresso. She mentions Klatch Coffee's creation WBC. She loves espresso blends, and she explains why. She explains the art of espresso brewing, and she pulls two amazing shots with a Nuova Simonelli. I’ll start with a funny story involving an espresso lover friend of mine. He calls me one day frustrated that his espresso tastes average most of the times. He was buying the good stuff from Illy. He knew his coffee blend was a good quality, yet he couldn’t reliably pull decent shots. His coffee was under average sometimes, and close to perfection sometimes. This went on for a couple of months. He had a decent machine, the Gaggia Classic. Yeah, Gaggia can be a bit temperamental, but not to that extent. I knew right away what was the problem, but I let him explain the whole brewing process. I asked him more about the beans and how he stored them, more exactly. It turned out he was storing the beans in a paper bag near the stove. The beans were constantly exposed to heat and air. So he had Illy quality beans for 2 days maximum. He had the ground coffee from Illy, which is amazing, but ground coffee expires even faster than whole beans. The lesson here is that even the best beans and blends need proper storage from the packaging to the grinding time. Make sure your coffee is properly packaged and stored. I love small roasters, and I buy coffee from them. Small roasters, however, are not subject to strict processes like the big roasting companies. If you know your roaster just got a batch out, or if your roaster has a subscription-based system, it’s fine. But sometimes small coffee roasting companies don’t have enough sales and they have to keep coffee longer on the shelf. Big companies have big stocks and their beans need to stay on the shelves for longer. However, their packaging technology is designed to keep the beans fresh for longer. Lavazza Espresso Super Crema is one of the most popular espresso beans on the market. It is a bestseller on Amazon, and people are leaving rave reviews. Italians are renowned for their espresso, and good coffee goes beyond business in Italy. It's just a matter of pride. We often associate big corporations with over-efficient processes, to improve profits. Big coffee roasters have the advantage of improving on many aspects of selection, roasting, packaging, and distribution. These improved processes help both the business and us the consumers. Lavazza Super Espresso is a blend of Arabica coffee beans from various origins. It combines beans from Brazil, India, Colombia, and just a hint of high-quality robusta from Indonesia. The blend has notes of honey and almonds, and it is a medium roast. We have three more great choices of beans for you, but before getting to that, I wanted to point out the differences between blends and single origin beans. I love single origin coffee because they are unique and they have distinctive flavors. However, many single origin coffees produce very little crema, and I'm a traditionalist. If there is no crema that's not an espresso. On the other hand, blends are meant to provide consistency and to be recognizable. I've said it before, coffee taste is very subjective. Most importantly though, people get used to a certain coffee taste and they don't like to change. That's why blends are so important. The origin of the beans is not critical, you can get a decent espresso with almost any beans, as long as they are good quality ones. Obviously, they would taste totally different, depending on the provenience. But that is the point of single origin. Why then create blends, and why Lavazza and Illy are so good? This is all about creativity and creating a consistently good blend. I’ll explain in a second. When a roaster sells a single origin that customers love, everybody wins. The roaster has great sales, the customer has a great coffee. The problem is that the coffee is not going to be the same from batch to batch, even if it’s harvested from the same piece of land. So whatever great beans the farmer got last year, are different today. This is the biggest problem when roasting for espresso. The beans are great anyway, but coffee taste is very subjective. A great coffee takes a week or more to get used to if you are not used to cupping. Most of us are not. Sweet Maria's has a great page on blends in general, not just espresso blends. A perfect example of the single origin is the MonoArabica from Illy. It is not a true single origin like Illy would like us to believe. However, I wouldn't worry much about that, because it is a really nice coffee. The Brazil MonoArabica has an intense flavor, with persistent dark chocolate notes. The master roasters from Illy are authorities in the field, and their beans are just amazing. However, in my eyes, the packaging is of equal importance. Illy coffee is packed in a pressurized can designed to stop the coffee oxidation. The packaging at Illy is an innovation in the field and is probably one of the best ways to ensure freshness. But a blend is so much more than consistency. A blend is also the chance to improve the shot. By mixing beans with different characteristics, the roaster creates a coffee that is better than the individual beans. For instance, you normally wouldn’t pull shots from Robusta beans. The vast majority of coffee beans on the market are different varieties of Arabica coffee. However, Robusta is great for making crema, and 10-20% Robusta in your blend is just perfect. By adding a Yemeni bean, we add some spicy pungency to the blend. We can then balance that pungency with a little sweetness from a Sumatran bean. Add some lightly roasted Ethiopian Sidamo for the fruity aftertaste, the acidity, and the earthy bite. As a conclusion, if you are still not clear what is best, there is no right or wrong. Blends you get the refined, consistent taste, while single origin brings you personality, uniqueness. If you are so inclined, you can even make your own espresso. Here is a great article that explains the art of blending beans for an espresso. I tried it a few times, I bought green coffee from Sweet Maria's and roasted it myself. It was a great experience, and I plan to repeat it, though is just a hobby for me. My blend wasn't bad, but compared to commercial blends was just OK. Even my single origin roasting was decent, and I pulled great espressos from those beans. I love Kicking Horse coffee. Their beans are just great. I wrote a review on their coffees here. Their espresso is really good. I bought a few times from their online store, and it was awesome, and the coffee was very fresh. They closed their online store, and they sell now through distributors exclusively. It helps them focus on the roasting side. At the same time, coffee can be a month old, when you buy it from Amazon. The bags are airtight with valves to ensure coffee degasses properly. However, at this moment they don't flush with nitrogen as the bigger guys do, (Lavazza and Illy). I really love this blend, honestly. What I don't like is that there is no option to buy smaller packages. When you buy 2 pounds of coffee, you need to realize that they would go stale after 2 or three weeks. Yeah, you can use my coffee storage methods, but you should have the option to buy a smaller package. If you are looking for ways to improve your espresso experience, Kona coffee is one of the best options. 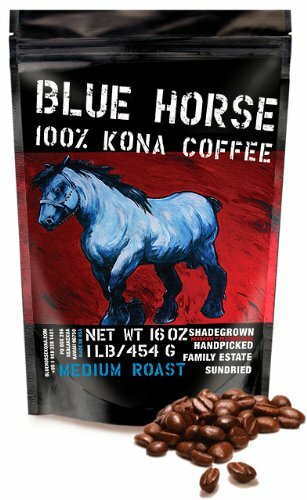 Blue Horse sells a medium roast single estate, made exclusively with beans from their farm. The beans boast the Hawaiian coffee sweetness with just the right amount of bite. It produces a lot of crema, and the taste is just unique. Not your typical espresso blend though. The Blue Horse coffee also stands apart from your typical espresso blend, with a medium roast. This helps to retain the unique Kona character. I know the title promises five beans only, but I couldn't omit Intelligentsia from the list. Not because their name sounds cool, but because their coffee is great. Black Cat is Intelligentsia's project to innovate the dull and common espresso blend. As they say it: they want to "expand what is possible in terms of flavor, aroma, and mouthfeel". They also hope to challenge us, the espresso lovers, "to reconsider what espresso is and what it can be"Black Cat is a blend and as such, it could be different from season to season. The Black Cat Analog blend is a Brazilian blend, that has a bit more brightness than your regular espresso. It has a dark and abundant crema, and a syrupy mouthfeel, and a lot of sweetness. Chocolate tones make it feel like "I know this blend, I tasted it before". The extra brightness makes it different, but ultimately it is designed to be comforting. Sure, that's a little shift from their promise about Black Cat, but I'll take that every day.